What’s the IQ of your loom? Is this about measuring the intelligence of a machine? Almost. The Indicator of Quality (IQ) is a benchmark that Starlinger & Co. GmbH is introducing together with the new FX 6.0 circular loom series. Following the successful launch of the RX looms in 2012, Starlinger is presenting the next level of high-tech circular weaving: The new FX 6.0 series. After thorough testing in the company’s own technical center as well as with customers out in the field, the new loom is now ready for serial production. Its main distinguishing feature: an IQ of 350 meters. This benchmark figure indicates the meters produced on a loom divided by the number of warp breaks. The Indicator of Quality serves as a means of evaluating and comparing the loom performance and fabric quality. 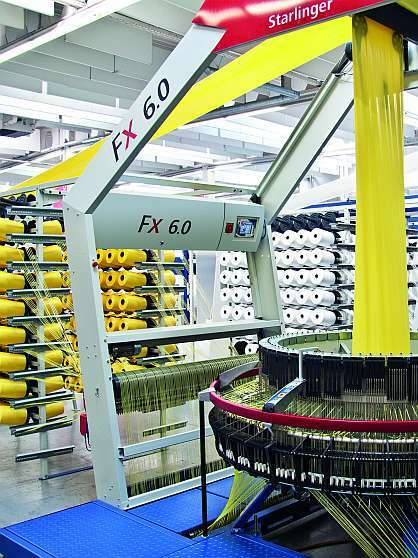 In this case it means that a warp break on the FX 6.0 occurs on average only every 350 fabric meters, while conventional looms on the market have warp breaks every 80 – 120 m.
Less warp breaks translate to reduced machine downtime and better fabric quality. High-quality tape fabric, in turn, reduces waste in the follow-up processes, e.g. sack conversion, and avoids problems due to leaking sacks during the product filling process. Starlinger has integrated the intense research and know-how build-up of the last years in the new FX 6.0 looms and is setting a new level of circular weaving technology. With a weft insertion rate of 1,200 picks/minute as well as an efficiency of more than 90 % and a patented warp monitoring system on the creels, the FX 6.0 sets the stage for intelligent woven packaging production. Woven packaging producers do not only profit from the unprecedented fabric quality and minimum width variations of ±4 mm, the FX 6.0 loom also achieves the lowest production costs per square meter of fabric. The first machines of the new series are presently being installed at Has Sentetik Çuval ve Tekstil San., a producer of woven bags for industrial and commercial use as well as FIBC fabric in Gaziantep, Turkey. “A decade ago we were the first ones to install the successful Starlinger alpha 6 looms here in Turkey, and now we will be pioneering the installation of the new FX 6.0 series”, said Tamer Özmermer, Member of the Board at Has Sentetik. In the course of the past decades Starlinger has supplied more than 1250 circular looms to textile packaging producers in Gaziantep, one of the main centers of the Turkish textile industry. To learn more about the new FX 6.0 circular loom people can visit Starlinger (Booth 106A tekstil servis / Hall 1) at the OTM Middle East Textile Machinery Exhibition in Gaziantep, Turkey, at the booth of the Turkish sales representation tekstil servis.